This post is sponsored by Mirum but all opinions are my own. I cannot wait for Spring! I can't believe we are supposed to get a couple inches of snow today and it's almost the middle of March. Last weekend was in the 70's - and it got me itching for shorts, bright lipsticks, and new hairstyles. You all know I LOVE sharing hair products & tutorials lately - it's one of the most requested kins of content I get here and on social media. It's always my goal to try things that work for a wide variety of people at various price points - and I'm so glad you all have been loving it! 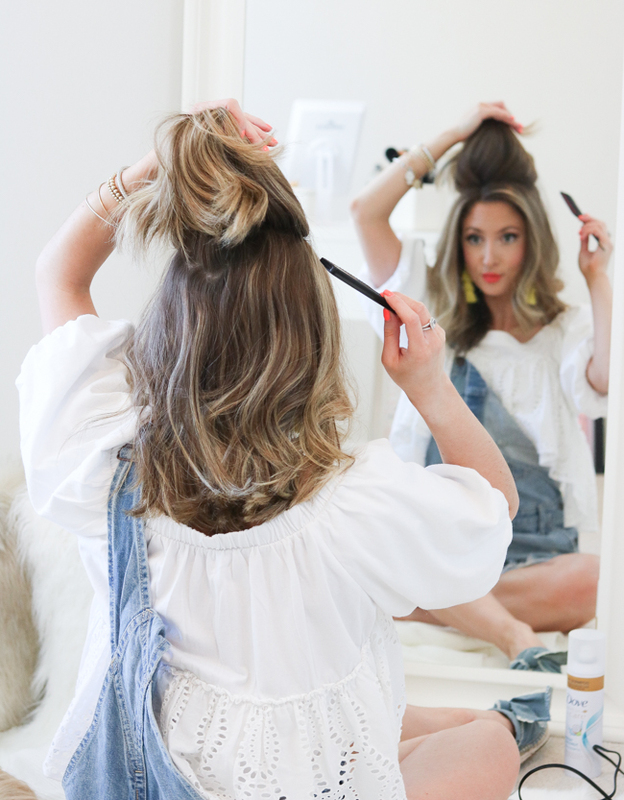 Today I'm sharing a Spring-inspired hair tutorial you can easily recreate if you're in a rush. You'll find step-by-step instructions and products from TRESemmé®, Suave®, and Dove. I think this shampoo is really cool! And I was drawn in immediately by the packaging and the different formulation. 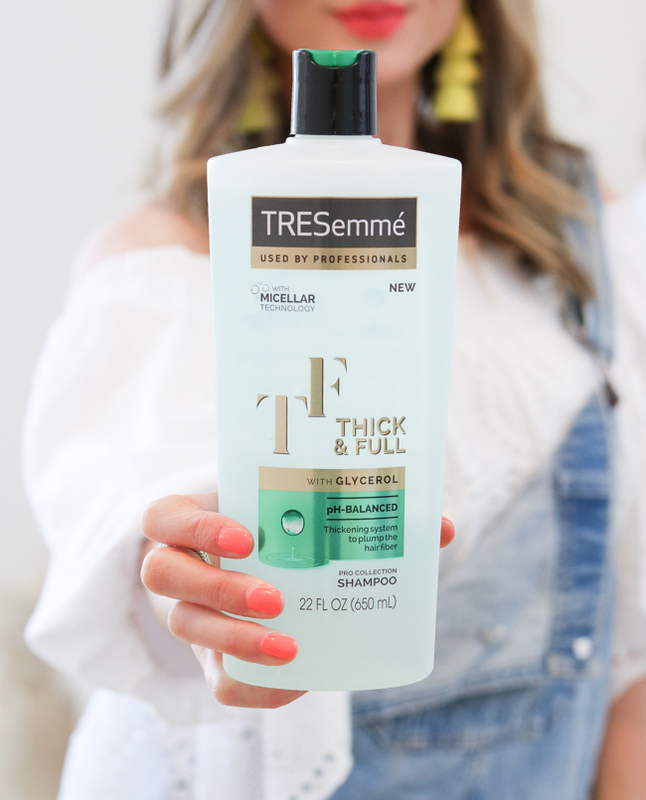 TRESemmé® Thick & Full Shampoo is designed to cleanse away impurities for everyday washing - which is GREAT for any of you who have hair that gets oily quickly. The PH-balanced formula helps to protect the delicate structure of your hair. This is also a great product for any gym goers who need to wash regularly due to sweating. AND it's a huge bottle so it'll last you a long time! 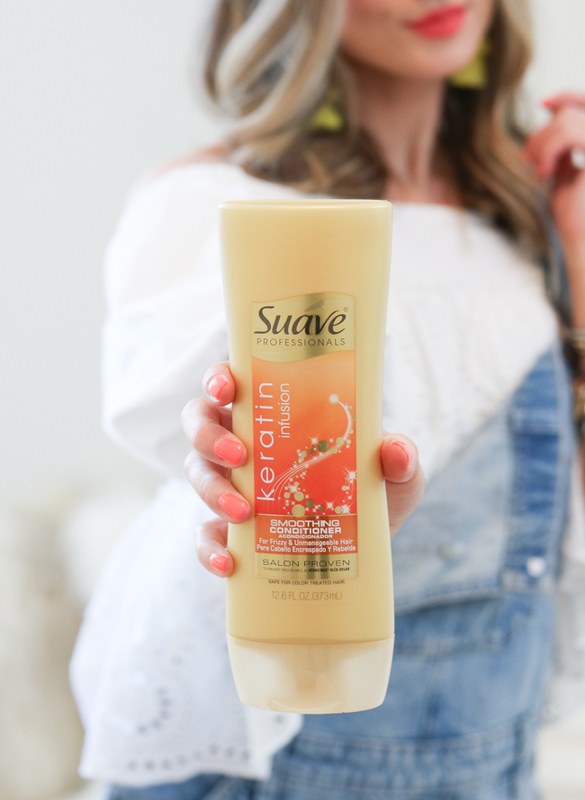 For conditioner, I recommend Suave® Keratin Smoothing Conditioner. 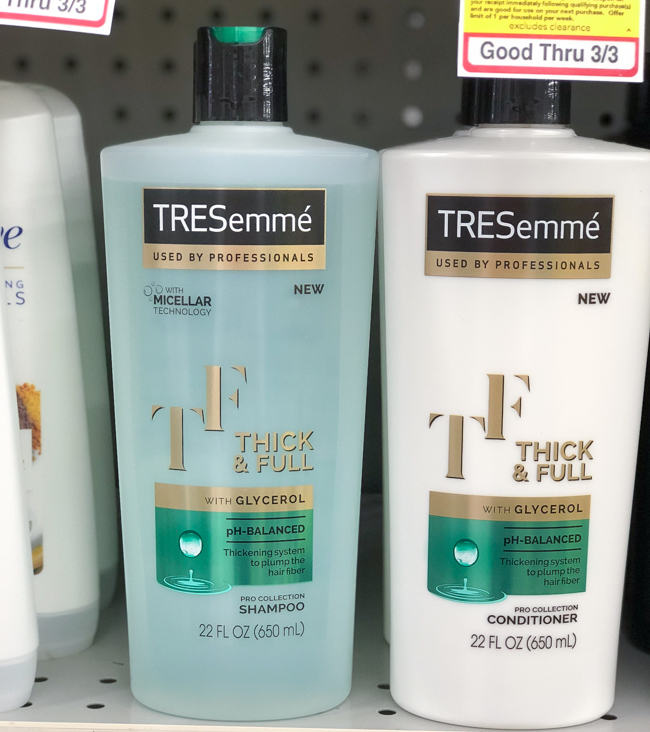 You all have seen variations of this shampoo and conditioner on the blog before. I think I've purchased just about every one they offer lol. They are super affordable and all smell amazing! This particular formulation contains smoothing keratin that gently cleanses and seals hair cuticles. 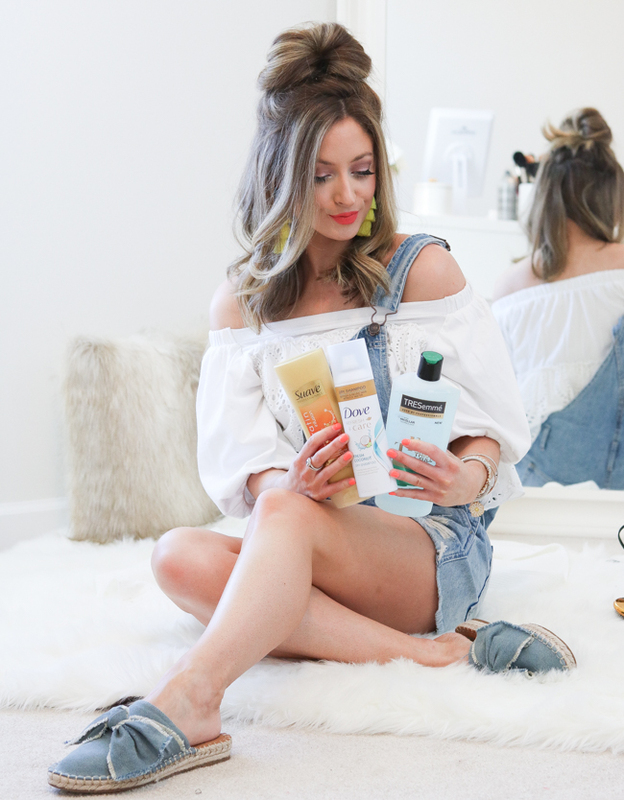 Even though spring and summer are less drying, I still look for products that hydrate my strands. I know many of you, myself included, don't always (or ever) have an hour to do your hair. The look I'm sharing today takes 10 minutes or less and can even be worn if you're working with second or third-day hair. 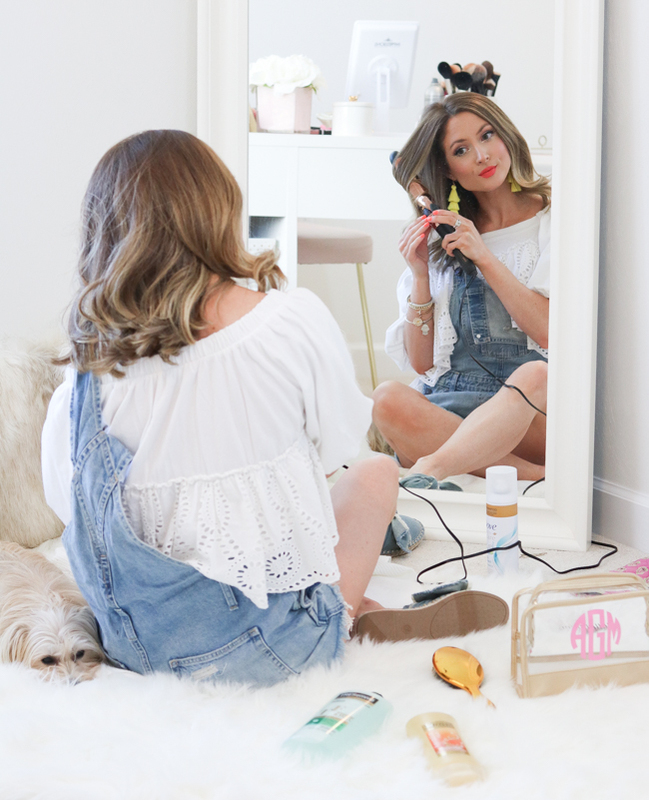 For this tutorial, you'll want lots of volume and texture, so I start by taking a 1 1/4 inch curling iron to place loose waves throughout my hair. I only leave the iron on my hair for a couple seconds and place fairly large sections of hair around the barrel. You don't have to be perfect - we're going for a tousled, fun look! 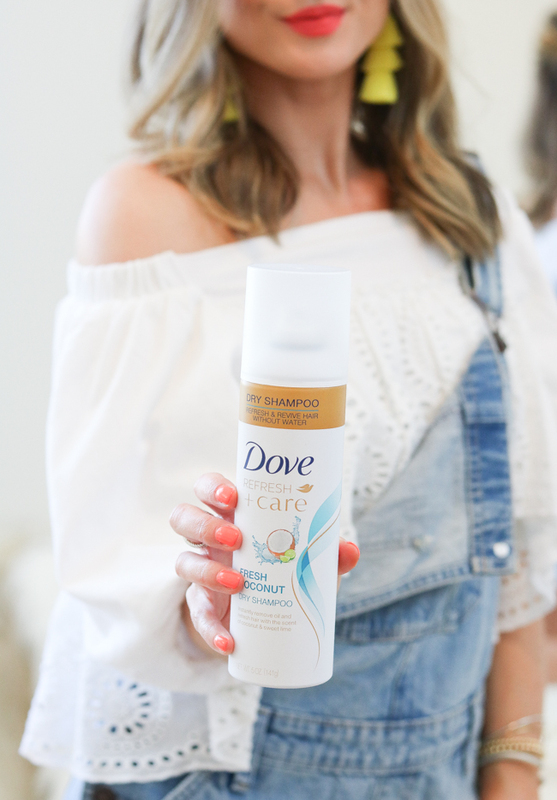 After curling, I use Dove Go Fresh Coconut Dry Shampoo at the root of my hair to create texture and volume. This obviously also helps if you need to wash your hair. It absorbs excess oil from the hair to keep it nice and revived. 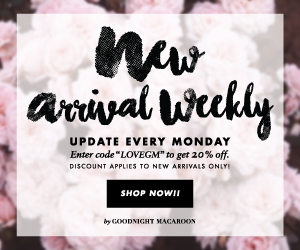 I own two different versions of this product and absolutely love it! I've tried SO many different dry shampoos and this is one of the very few that I've ever liked. It actually makes the hair feel fresher and creates a velcro-like texture when teasing. 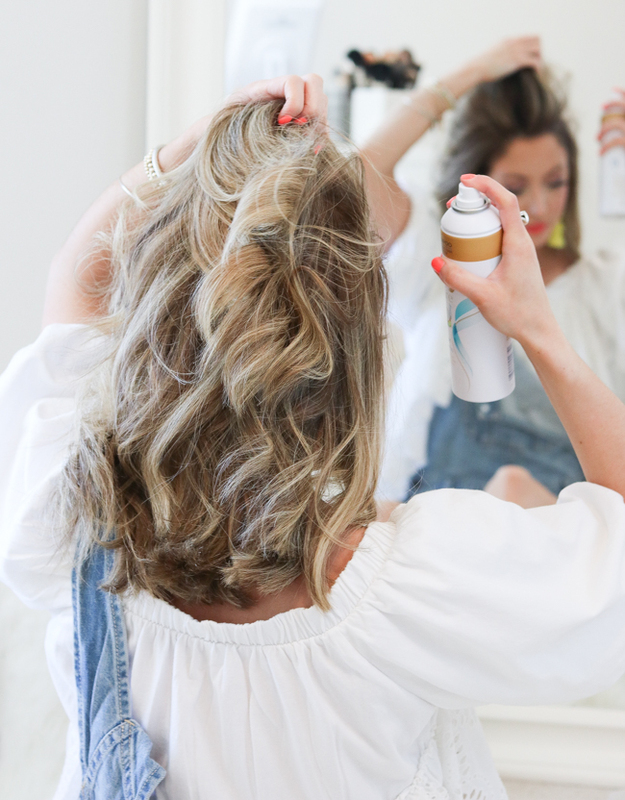 After spraying dry shampoo at the root, I immediately take my teasing comb and backcomb starting about an inch away from the root down. I like to tease the back section separately from the front two sections, that way it's easier to find my part when smoothing out strands. Backcombing against the dry shampoo really helps the volume to stay - can you say big hair?! Your hair will also smell fantastic! Next, I grab a large section of hair at the back of my head, leaving two front sections. Holding on to this section of hair, I take a clear rubber band and wrap twice around the hair. On the second twist of the rubber band, don't pull the hair all the way through, as seen above. Carefully, without pulling ALL of your hair out of the rubber band, pull the hair in a fan motion to the right and left. It may take a couple tries to get the hang of this, but it's super simple and looks much more complicated once you're finished. You can obviously fan the hair out as big or as little as you'd like. Once fanned to your liking, I like to take a couple bobby pins and pin down the sides of the fan under the hair. This will keep the fan higher up on your head, and will make sure the rubber band is disguised. You can even use a clip at the back of the hair if needed - but the bobby pins are easier to conceal. Now we want to make sure we have as much volume as possible. Pulling the hair back can take away from a voluminous look, so I like to pull some of my hair forward on the top of my head, so that it's not pulled so tight into the rubber band - I hope that makes sense! 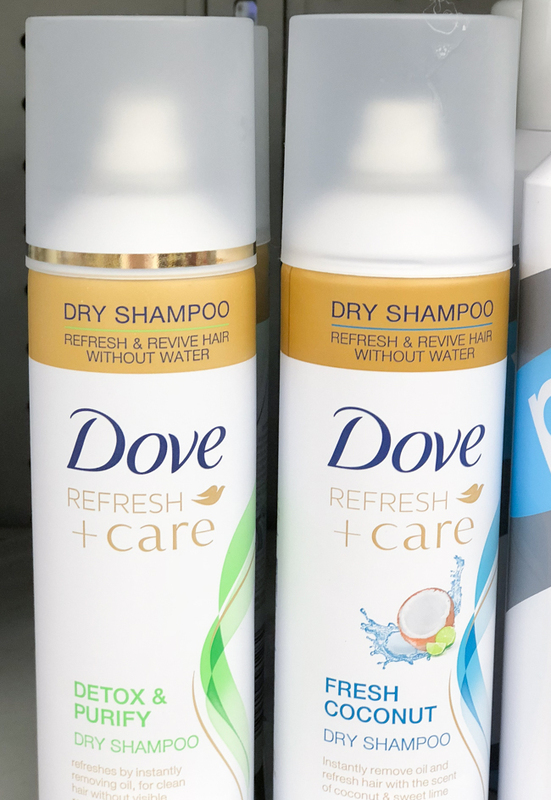 Additionally, I like to take my teasing comb (you can always use extra Dove Go Fresh Coconut Dry Shampoo) and tease the side and back of my hair around my half-up do. I also tease the two front sections so they aren't falling into my face throughout the day. Lastly, carefully brush the ends of your hair and any areas that may look unruly. Now you're ready for a fun Spring event or even just the day to day. My outfit made me feel very "festival" so this would be great for a Spring or Summer concert. 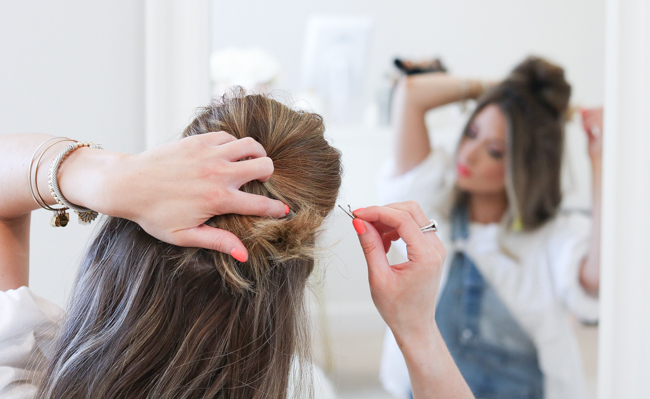 You could also follow these same steps to create a top knot bun. I wear my hair like this often and get lots of questions about how I achieve the style. It's so much easier than people think! You could even wear this look with straight hair too. If you end up recreating it, I'd love to see! 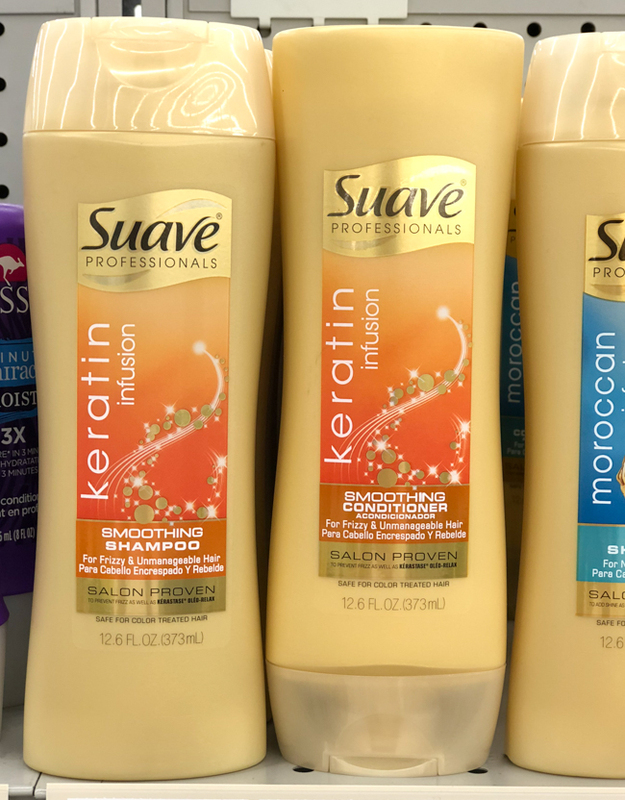 As always, here are some amazing offers from CVS on SELECT TRESemmé®, Suave®, and Dove hair care products so you can grab some for yourself!